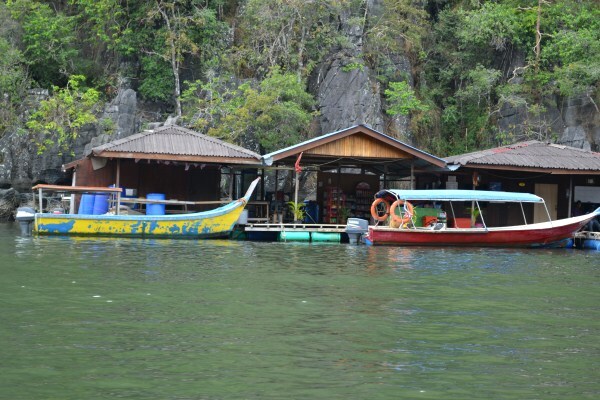 When searching for adventure on the island of Langkawi there is no shortage of things to do. Kayaking, caving, hiking, and jet skiing are just a few of the options. Tours abound! 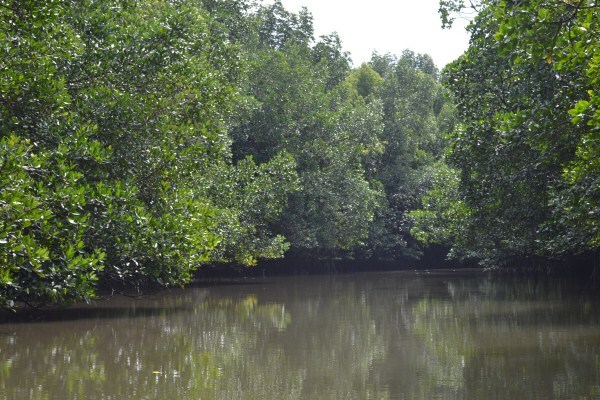 One of the more popular tours to take is in the mangrove area, Kilim Geopark, in the North East corner of the island. We typically do not take tours as I worry that the kids may impede the outing for others. We also like to move at our own pace allowing for more time inquiring about something or less time when impatience begins. That being said everything I read pointed me to the fact that we would need some type of tour or guide to get around and really get the most out of the Kilim Geopark area. We considered simply hiring a boat and going it on our own but then Dev’s Adventure Tours offered to host us. Not being a family to ever turn down an adventure we drove ourselves over to the docks and met up with our guide Jerome. We happen to have a car here so decided to meet at the park, but all tours with Dev’s includes transfer to and from your hotel. Immediately we knew this was going to be a great day. Jerome beamed a huge smile, spoke to the kids, and had an energy and passion for wildlife that I was not expecting. I could tell this was going to be a kid friendly tour, and I was right. We were on tour with another family so the kids actually outnumbered the adults, a point my 9 year old let me know quickly. Our first stop was the bat cave. Jerome was so informative pointing out things we would have never seen on our own and answering the kid’s questions so patiently. 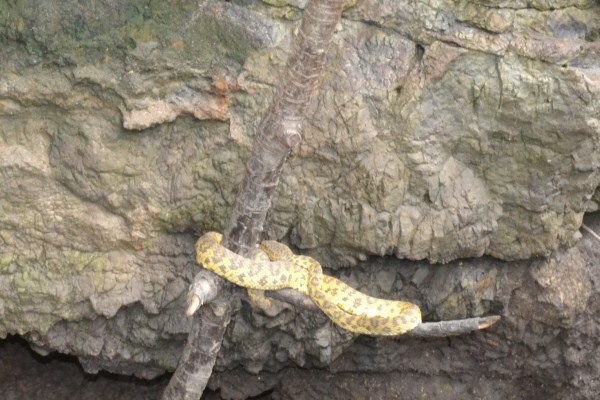 We spotted snakes, otter tracks, and of course bats. We were not allowed to use flash near them but as you can see we really didn’t need it as they were so close. 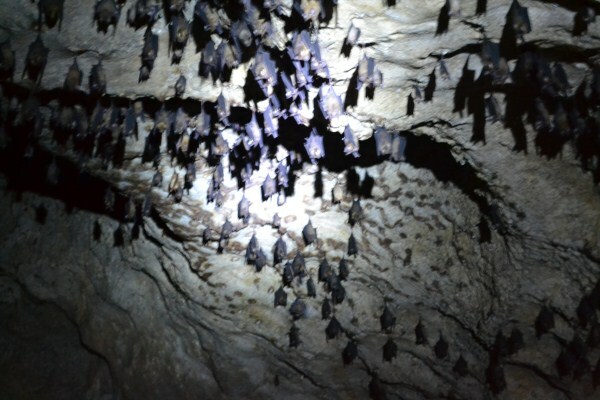 We have visited many caves with bats in the past but this one was by far the coolest for the kids. We all learned so much and were able to see the bats up close and personal, a little too personal for me but that’s a story for another day. After the bat cave we rode through the mangroves learning as we went. 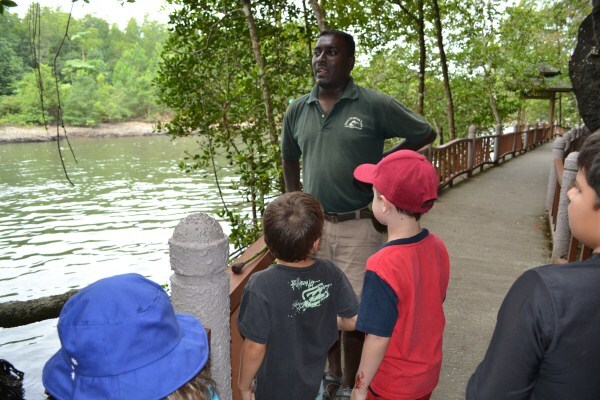 Jerome told us about Langkawi, about the mangrove, and so much more. 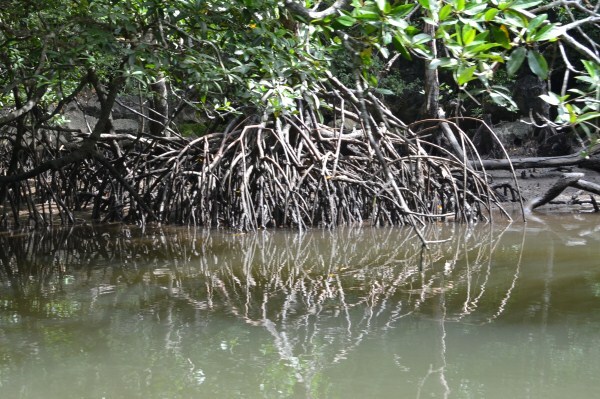 Did you know that the seeds of the mangrove trees can float around for 1 year before they die giving ample opportunity to plant and start growing? 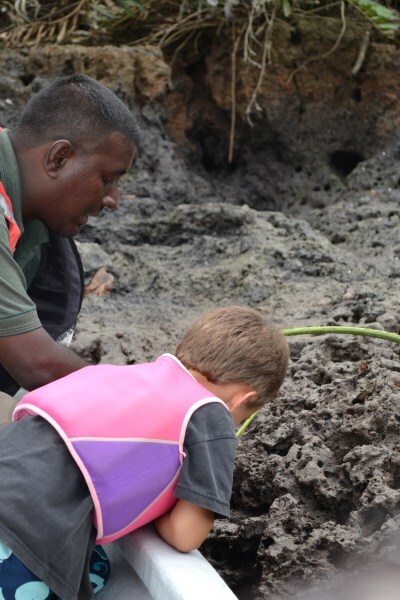 Did you know that the mangroves will eventually close in making more land for the island, pushing up the soil through the massive root system? 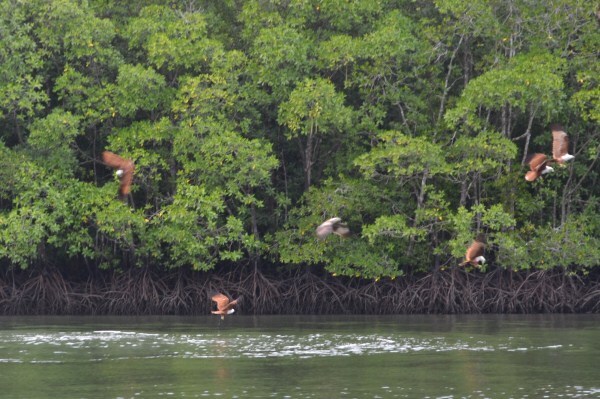 Mangroves are a fascinating spot to visit. We sort of made our own way as Jerome left it up to us as to what we wanted to do, which I really enjoyed. The whole tour we felt relaxed and had a sense of flexibility that I am sure most tours do not offer. We all agreed that exploring rather than sun bathing on a beach was far more fun. 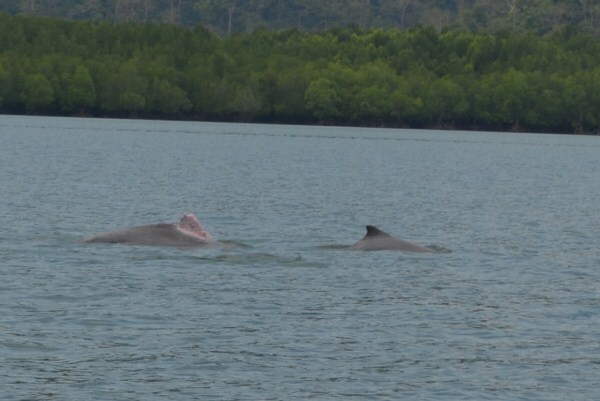 Along the way we spotted wild dogs, numerous snakes, 2 different types of monkeys, otters, eagles, many different birds, and as a finale….dolphins! Supposedly it is quite rare to spot them so we were all thrilled and felt it was an icing on the cake moment, even Jerome! They were magnificent, small and pink bellied. We watched them for at least 30 minutes before begrudgingly moving on with the day. Eagle feeding was up next although we did not do any of the feeding! Dev’s tries to be very eco conscience and feeding eagles is not a very good idea. Jerome explained that it hurts them in the long run as they no longer need to hunt for food and so lose that instinct, not to mention how bad placing fatty food in the water is. We could see the chicken fat running through the water for quite some time. Yes I said chicken…the other tour guides feed birds to the eagles creating a cannibalistic situation. It just felt wrong on so many levels. Please avoid feeding the eagles if you are in Kilim or anywhere for that matter. Moving off my soapbox, the birds were beautiful and the kids really enjoyed trying to count them as they moved about so effortlessly. I must admit it was great to see them up close and I am sure that the opportunity would not have been there if the food wasn’t! We were all starving at this point. Jerome did give us water on the boat but I was glad we had a bit extra as well as a few snacks to tide the boys over. As we rode out into the open sea and were told that lunch was our next stop our curiosity peaked as to where we would end up. We hadn’t seen any buildings at all since leaving the boat launce area 3 hours earlier. Suddenly out of nowhere we saw a stretch of beautiful boats to one side and floating restaurants to the other. Sure enough this was our lunch spot. Dev’s tours include a simple lunch of 1 drink and fried rice and veggie/prawn/or chicken meal with soup. It was all delicious and even my pickiest boys scarfed it all down. The owner even made me a special steamed veggie plate and brought out a nice fruit plate to end the meal. The best part was the free entertainment. 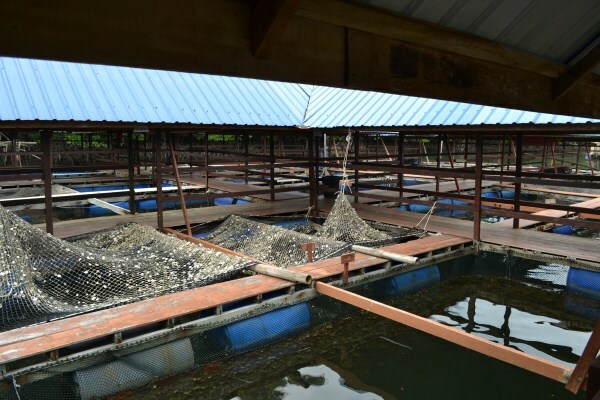 Located at the same restaurant was some sort of fish farm complete with huge tuna and grouper, manta rays, and eels. Time passes very fast when waiting for lunch with a show like that right next door. Although on its own I certainly wouldn’t make the trip out just to see it. 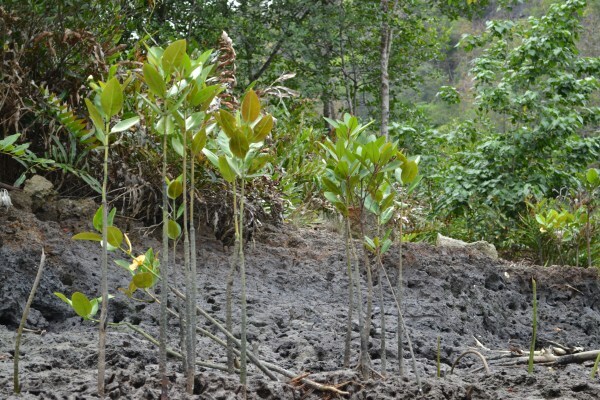 After lunch we stopped to plant our own seeds as a contribution for helping the mangrove to repopulate and thrive. The kids loved it as Jerome told them they was laying claim to their own piece of land! 4 hours after embarking we returned to the dock to say goodbye and head home. We had a great day! The things that stood out to me, making Dev’s different than your average tour, was first and foremost how family friendly it was. Interestingly, we saw a few other tours going out and coming back of Dev’s and could see that it was equally fun for couples and singles alike. In fact they offer a kayak tour through the same mangroves where you paddle yourself, a great outing for couples. They also start their tours at 1 person so even a single traveller will not miss out. I also enjoyed the fact that our boat was owned by the Geopark and driver was a local. I am told that all of the staff is local, which is important to me as I like to support the local economy. 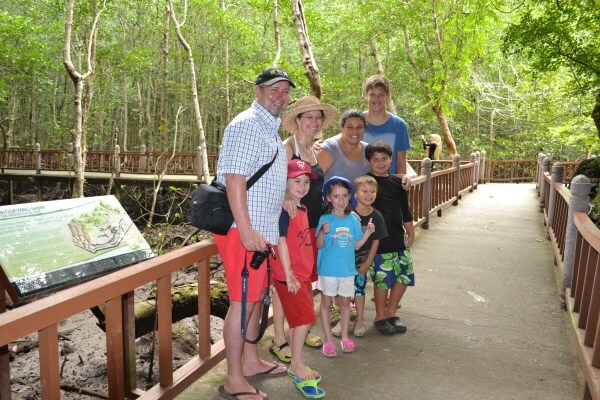 Jerome was professional, passionate, and knowledgeable about Langkawi and nature in general. The tour was really made special by his thoughtfulness and positive nature. 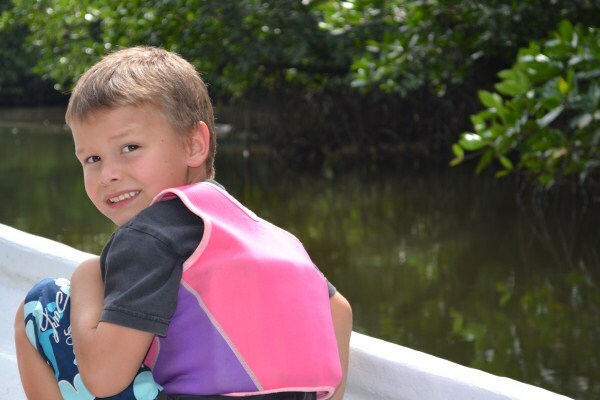 Life jackets were provided for all, even for the youngest children aboard. Each tour includes insurance making it that much more professional. I was impressed. Dev’s Tours also offers discounts as they have so many great tours you will most likely want to take more than 1. They offer an eco-package that gives a 20RM pp discount on a second trip. I have heard from many that the evening nature walk is amazing. I think you could definitely find a cheaper tour but I do NOT think you could find a better value for your money! I also like that they are affiliates with the Charity club on the island sponsoring trips for underprivileged people and for school children to help educate them about nature and conservation. You cannot care about something unless you are around it, educated about it, and learn to love it! 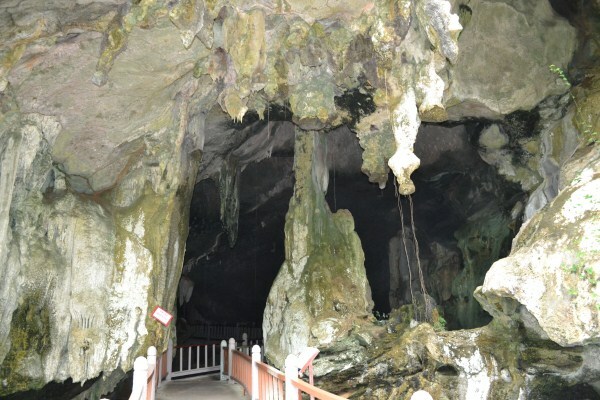 To keep Langkawi as beautiful as it is now will take the locals protecting it! 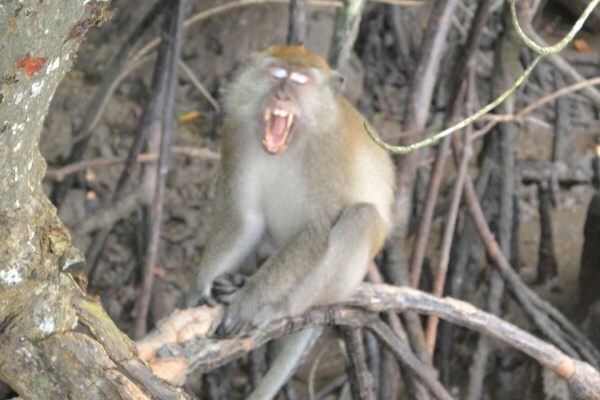 For prices and a list of tours on offer go to www.langkawi-nature.com or head over to their Facebook page. In the interest of full disclosure we were given a tour in exchange for our review but as always the thoughts and opinions here are mine alone…well with a little help from my rug rats. It was sincerely a great day and I would not hesitate to recommend a tour with Dev’s Adventure company to anyone! That was really great and I just don’t know with what picture to start. I’d love to see more of them. That looks like a great trip. Hope to make it through here with my family in the future. All the best! 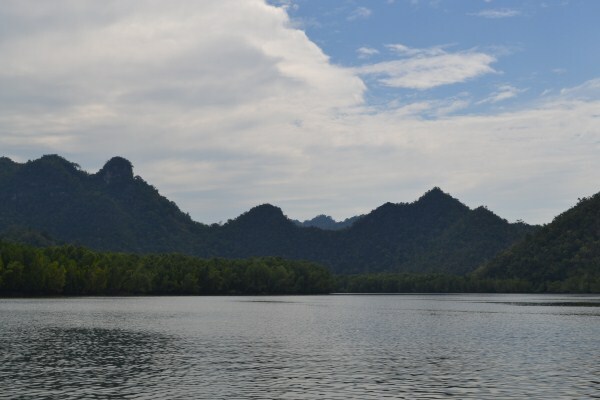 Island of Langkawi has set an example for adventure and I love this place hope to visit it soon.